During the Second World War, both Allied and Axis nations engaged in a multi-media propaganda battle. Leaflets, posters, film reels, and radio broadcasts were all used to spread misinformation and undermine the morale of enemy troops. Japanese Radio Tokyo broadcast an English language, anti-Allied program entitled the "Zero Hour." The program featured popular music and propagandist war reports read by women with alluring voices. While Radio Tokyo employed over 20 women on the program, the voices became collectively known among Allied soldiers as Tokyo Rose. Though the moniker Tokyo Rose was popular legend, after the war, details of the Japanese Radio Tokyo propaganda program emerged that brought legend to life. An investigation revealed that Allied prisoners of war, under orders of their captors, produced "Zero Hour." The women who voiced the programs were mostly Japanese citizens. One of the women, however, was an American citizen. This changed the nature of the military investigations from a general inquiry to a treason case. Iva Ikoku Toguri was born in California in 1916, a firstgeneration American citizen of Japanese descent. She attended the University of California, Los Angeles, and graduated in 1941. Shortly after graduation, Toguri went to Japan at her mother's request to care for a sick relative. Leaving in haste, she neglected to obtain an official passport that would aid her return to the United States. While in Japan, the Japanese military launched an attack on the American Pacific fleet at Pearl Harbor, bringing America into the Second World War. After war was declared on Japan, Toguri was denied her request to return to the United States. She refused to renounce her American citizenship, and was often placed under surveillance by the Japanese government as a possible enemy operative. Toguri spoke very little Japanese and from 1941 to 1943, she went to school to learn the language. She later took a job as a typist for Radio Tokyo in 1943. Because she knew English, Japanese executives at Radio Tokyo recruited her to voice the "Zero Hour" program. Toguri broadcast under the name Orphan Ann, and worked on the show until the end of the war. 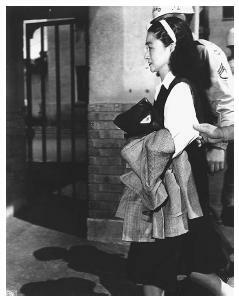 Iva Toguri D'Aquino, also known as Tokyo Rose, on her way to court in San Francisco, California in 1949, where she was on trial for treason and broadcasting propaganda to Allied troops during World War II. colleague led reporters to Toguri, after accepting money offered by reporters for the interview. Assuming she had committed no crime as the broadcasts were directed and produced by prisoners of war, Toguri spoke freely with journalists about her role on Radio Tokyo. Conflicting reports exist about her reception of the nickname Tokyo Rose. The press about Toguri, along with the detailed notes of a couple of reporters, was brought to the attention of U.S. Army counter-intelligence. United States Army authorities arrested Toguri in 1945. In 1948, she was brought to the United States and transferred to officers of the Federal Bureau of Investigation. After a five-year inquiry, Toguri was tried as the infamous Tokyo Rose on eight counts of treason. Acquitted of seven counts of treason, she was found guilty on the remaining charge of "speaking about the location and destruction of ships." She was sentenced to ten years in prison and a steep monetary fine. When released in 1956, she immediately sought to clear her name. She applied twice for a presidential pardon, but was denied. The matter of Tokyo Rose disappeared from the public eye until a journalist in the 1970s probed for further information on the case. A series of articles revealed several incongruencies in the inquiry and trial of Toguri. Prosecutors argued that Toguri fled the United States before the war and was possibly a Japanese intelligence agent, but scant evidence was offered. Testimonies of several Allied service members regarding the radio broadcasts were revisited, and Japanese records regarding the Radio Tokyo psychological warfare campaign were unearthed. Interviews of some of Toguri's wartime colleagues corroborated her earlier claims that she sometimes smuggled supplies and food for the Allied prisoners also employed on the "Zero Hour" program. Further interviews and documents revealed that information regarding ships and troop positions that Radio Tokyo broadcast was available in wartime America on short-wave radio and was selected by the POWs forced to work on the program because it was not immediately sensitive to the Allied war effort. The controversial treason case was never reopened by courts, but Toguri was issued a pardon by President Gerald Ford, in one of his last presidential acts, in 1977. Duus, Masayo, and Edwin O. Reischauer. Peter Duus (trans.) Tokyo Rose: Orphan of the Pacific Tokyo: Kodansha International, 1979.